Members of the Mabel R. Krows Legacy Society, established in 2012, have demonstrated their commitment to the Daughters of the Nile Foundation by providing their very special financial support in naming the Foundation as a beneficiary of a planned gift. Planned gifts might include a bequest and/or charitable income gift of appreciated assets, establishment of Charitable Remainder Unitrusts or Charitable Remainder Annuity Trusts that ultimately benefit the Foundation, or gifts of life insurance policies. Once you complete your estate plan, please let us know. 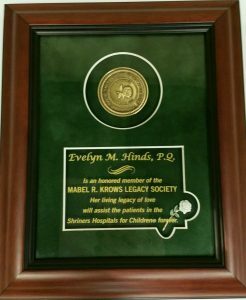 We would like to thank you for your generosity by including you in the Mabel R. Krows Legacy Society. There are no dues or other obligations of being a member of the Mabel R. Krows Legacy Society; however, it does allow us to thank you, recognize your generosity and to be an inspiration to others. To qualify, you need only send a photocopy of the applicable section of your will or trust, naming the Foundation as a beneficiary, to the Secretary of the Foundation. The most important benefit, is the satisfaction of knowing you have joined with the Daughters of the Nile Foundation and that you are “Making a Difference” in the treatment for such medical issues as scoliosis, osteogenesis imperfecta, limb deficiencies, club feet, leg length discrepancies or juvenile rheumatoid arthritis and the medical care of those children who have suffered acute burns. Dr. Joseph Ralph Linn, Jr.